two weeks out, so why not? Tony Pauline on Journey To The Draft Podcast says that Dexter Lawrence is a fast riser and could even go top 15 ahead of Ferrill and Christian Wilkins. I love Ferrell and Wilkins so either of those I’d be happy with.. Ferrell is a game wrecker! Yup, disapponting but better than the disappointment of passing on him at 32. Ah, the fatalistic approach. With two weeks to go, I find that I, too, am embracing the sadness. Actually, I’m embracing the uncertainty of having 6 top 101 picks and plenty of needs. Can’t really predict where they’ll go. With the caveat that BB drafts do tend to disappoint on the day. Radio guys say the jets are looking to trade down from number 3. Bleacher report says the lions interested in trading down from number 8. 32. WR - AJ Brown? 56. OL (trade up?) - McGary or Lindstrom? And then how do we feel about Mecole Hardman at 73? We do need a punt returner. As Pat Kirwan said on Monday, "so? Who's going to trade up, and why, and for how much?" My only issue with 73 is the depth of the WR class. Hardman is ST only for me his rookie year. He's a WR convert and he's still learning the details -- during an interview at the Combine he had to clarify route depth with Godwin while diagramming a play. Not a big deal, but he mentioned that Godwin always knows and that he still has to ask. That tells me that he's likely another year away from regular contributions on offense. Many other players are more pro ready IMO. I'm not sure he's transcendent enough of a returner to use a 3rd (1 career TD return, 16 punts returned his senior year). Tate was actually very good with huge return production, although they had similar receiving stats in the passing game. I think he'll be there at 101 or 134; then I'm all in. Pros: led nation in punt return average. Cons: 5 fumbles on returns last 2 years. Few things I've seen or are in my head. Seattle is interested in trading down and acquiring more picks. They also apparently really like Juan Thornhill, who they would be willing to take at 21 if necessary but he's really more of a high 2nd round guy. Connecting the dots but a trade with the Pats makes a lot of sense for both of us. They could take Thornhill at 32 and we could hopefully move up for an impact guy. I know we all think we would trade up for Hockenson or maybe an impact DE (or even an OL like Dillard) but would we all go crazy if he traded up for Daniel Jones? Any link between us suddenly bringing in all these QBs and no movement on the Brady contract. It makes a lot of sense really. Last year everyone was talking about the urgent need to find a future QB and that we were moving up for Mayfield or Rosen or taking Jackson. And for some reason no one seems as bothered now even though Brady is one year older. 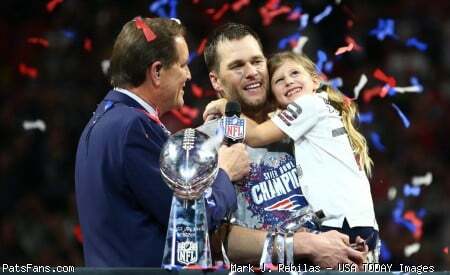 I'm still not convinced that a)Brady will play 4 more years, or b) Bill will want him to play 4 more years. I'm not sure if this means they'll trade up for a QB. I'm sure they'd be QB hunting even if Brady was under contract beyond 2019. They're facing the reality that their QB is 42 years old and that as much as the QB wants to play longer and thinks he can, and as much as the team is happy with the QB's current performance, they'd be foolish to not have a contingency plan as no one knows exactly when the drop off in performance will happen. This has the side benefit of the Patriots being able to pick the brains of the QBs they're facing in the next few years - and being able to work that advantage into their game planning. Collier was in Daniel Jeremiah’s top 50 back around the time of the combine. I wonder whether others are just catching up. I don’t mind if he’s ST only this first year. If we sign DT and draft an AJ Brown or Deebo, we’re almost loaded at the position with rookie, DT, Edelman, Dorsett, and Josh Gordon due to return. I’d be happy for us to break in Hardman slowly. I’ve basically come round to the idea that we have two major needs at WR and TE. Let’s just get those fixed this year and make them the focus of the draft. Any other positions are almost luxury picks. I HATE April! - This is the WORST time of the year if you are a Pats fan. When you pick at the end of what seems to be EVERY freakin' draft, for 2 solid months, you win the opportunity to hear all about the 2o odd players you AREN'T going see get drafted by your team. But seriously, it is tiring. For 9 months of the year, the Pats are THE most relevant team in the league, but by mid-February they become the most irrelevant team. So once again we grasp at straws trying to figure out who is going to even be there when the Pats FINALLY get a selection, and most comments about the best players start with the phrase....." but he won't be there at #32"
As for any rumors, I would just remind people that,if you had Wynn and Michell as your selections last year, I DESPERATELY need to know your thoughts on Powerball this week. Offensive tackle is a need too (although not necessarily major compared to WR and TE) - there is no swing tackle and they're relying on a LT who is effectively a rookie (who they're very high on) coming off an Achilles injury. But otherwise? Swap Bennett for Flowers and you're at a reasonably comparable place at DE (no Clayborn but his role/effectiveness was limited towards the end). Upgrade of Pennel for Shelton; haven't replaced Brown but a more effective player in Pennel may take up a lot of those extra snaps anyhow (as part of an overall rotation with Guy/Butler). Personnel at all other positions is pretty much identical to last year. To your point, luxury picks to try to upgrade from this right now. Offensive tackle is a need too (although not necessarily major compared to WR and TE) - there is no swing tackle and they're relying on an effective rookie (who they're very high on) coming off an Achilles injury. Yup. WR, OL, TE with the first three picks. I can see us signing a FA DT (Allen Bailey for example) and then maybe a DE or hybrid player late round three or day 3 (Anthony Nelson, Joe Jackson, Kingsley Keke, Omenihu). And then use the other day three picks to double dip at WR or TE. That stills leave two round three picks for trading if necessary. Agree on Wynn and Michel although in hindsight, if you asked yourself what the two biggest needs going into last year’s draft, OL and RB were at the top of the list. Or at least, they were the two biggest losses in FA. Much like WR/TE this year.